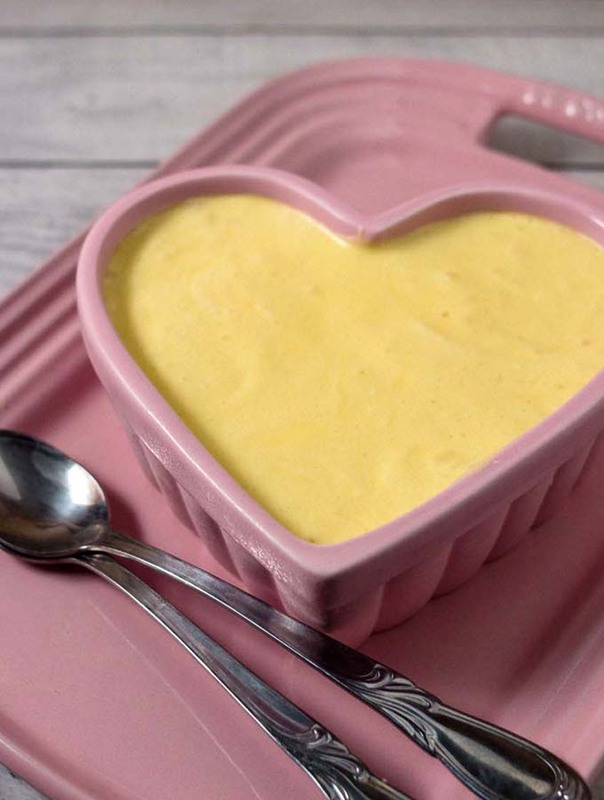 White chocolate frozen mousse has the texture of ice cream without the need to churn. Top it off with hazelnut whipped cream for a decadent end to a romantic meal. Welcome to Progressive Eats, our virtual version of a Progressive Dinner Party. 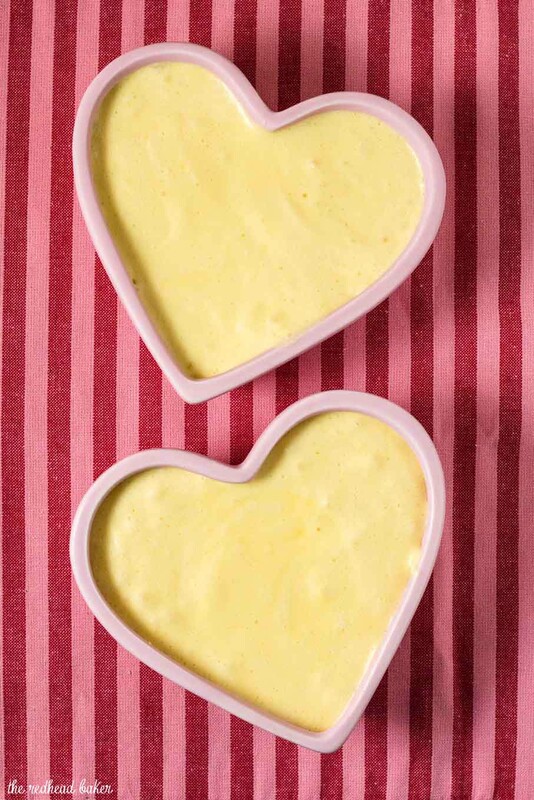 Our menu this month features romantic foods to inspire love! Hosting this month is Jane from The Heritage Cook. Valentine’s Day is around the corner! We don’t make a big deal out of the holiday in the Redhead Baker house. We exchange cards, and Dave usually gets me a box of my favorite chocolate. I sometimes make a fancy meal. We never eat out, because we don’t want to ask anyone to forgo the holiday themselves to watch our kid, and because restaurants are always crowded that night. We don’t usually have dessert at home on regular nights, but I do make dessert for our Valentine’s Day meal. One of my favorite desserts is ice cream, but it’s a pain to make space in my freezer for the churning bowl, plus ensuring time to chill the ice cream base, then freezing the churned ice cream. Did you know you can make a homemade frozen dessert that has the texture of ice cream but doesn’t require churning? It’s frozen mousse! 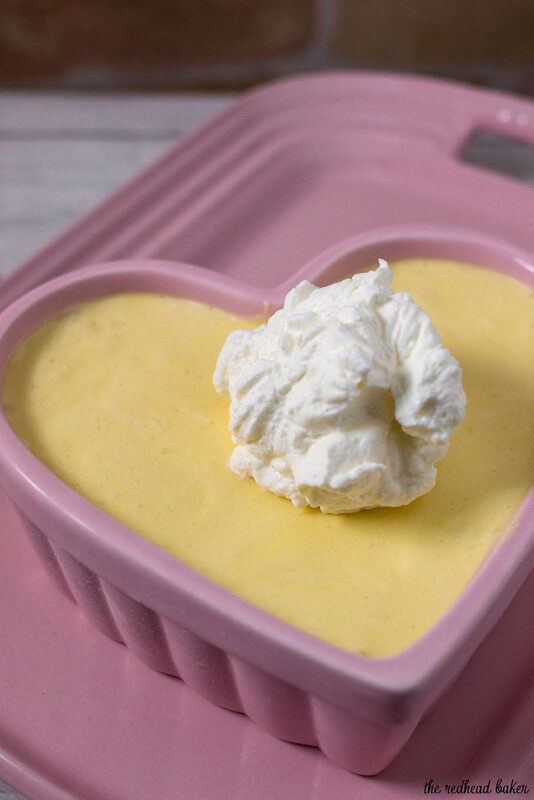 It’s very similar to regular mousse — beaten egg yolks, whipped cream and whipped egg whites are all folded together — but this goes a step further with freezing. A few tips: have all of your ingredients measured and set out, ready to go (this is called mise en place) before you start the recipe. Definitely have your cream whipped before you beat the chocolate into the egg yolks, because that yolk/chocolate mixture will start to set unless you mix it almost immediately with a portion of the cream. 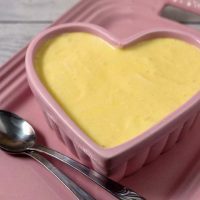 Unlike regular mousse, the mixture is a bit soupy when all of the parts are folded together, but this is deliberate, so that it doesn’t turn into a solid frozen block. The hazelnut whipped cream is a delicious complement to the mousse, and if you want to add textural crunch, add some toasted chopped hazelnuts on top of the whipped cream. Place the chocolate in a bowl and set over a pot of simmering water. Stir occasionally until melted and smooth. Set aside to cool. In a chilled bowl, and using chilled beaters, whip the cream to medium peaks. Add the vanilla, then continue whipping to stiff peaks. Refrigerate until ready to use. In another bowl, beat the egg whites until frothy. With the mixer running, gradually add the sugar and continue beating until the whites reach stiff peaks. Set aside. In a third bowl, beat the egg yolks until thick and light in color. With the mixer running, gradually pour in melted and cooled chocolate and beat until well-blended. Add one quarter of the whipped cream to the chocolate/yolk mixture, and beat on medium speed until incorporated. Add the remaining whipped cream to the bowl, and use a spatula to fold it in. Add one third of the egg whites and fold them into the chocolate/yolk/cream mixture. Once almost completely incorporated, add another third; fold it in. Then repeat with the last third. Divide the mousse among four 4-oz ramekins and freeze until set, at least 4 hours. In a chilled bowl, with chilled beaters, whip the cream until frothy. Add the sugar and vanilla, then beat to stiff peaks. Spoon one quarter of the whipped cream onto each ramekin and serve. Thanks! They’re from the Target Dollar Spot! Mmmmmm…..you’re speaking my language! 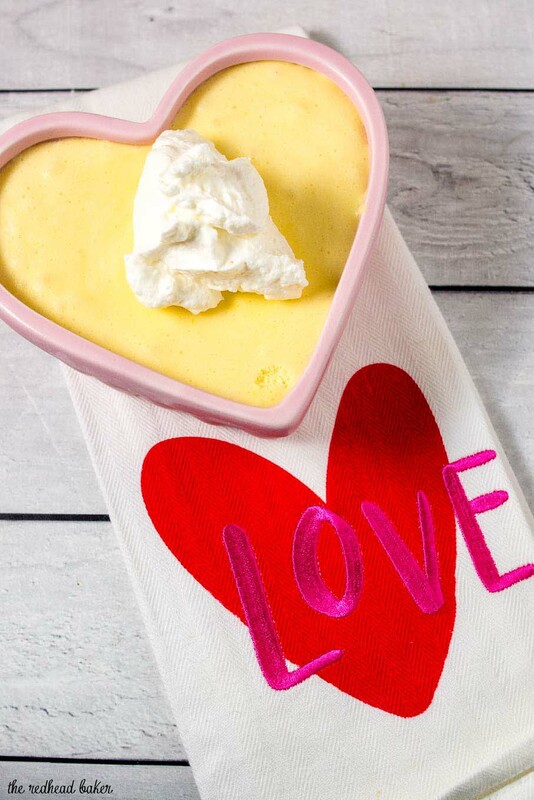 I love, love white chocolate desserts and these beautiful frozen gems are perfect for Valentine’s Day! Oh boy do I love white chocolate and mousse – and then you add hazelnut whipped cream? I am over the moon!! Beautiful! Hi Annemarie! They do not need to be eaten right away. Though, if freezing more than 24 hours, I would place a piece of plastic wrap directly on the surface of the mousse before you freeze it — this will prevent a crust from forming on the top. What a lovely dessert! 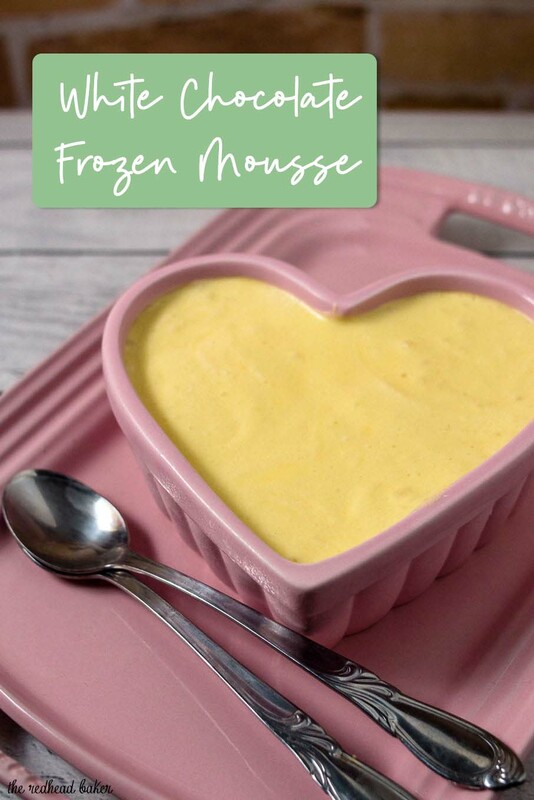 I’ve often made mousse, but never frozen mousse. And you had me when you added the hazelnut whipped cream. A total delight. This sounds elegant and delicious Coleen and I’m with Theresa…just adore those pink serving dishes…how perfect! Seeing these pics just made me smile big! Just so perfect and beautifully done! Oh Coleen – this is super intriguing to me especially with the hazelnut whipped cream and some crunchy toasted nuts on top. My son would have loved this 🙂 :-(. And your photos are darling. This looks good! Thanks for an idea for Valentine’s day. I’ll do it for my family.